The name viscosa means sticky (viscid)—this fungus usually has a very slimy feel to it. Identification: The fruiting bodies are no more than about 5" (12 cm) tall. 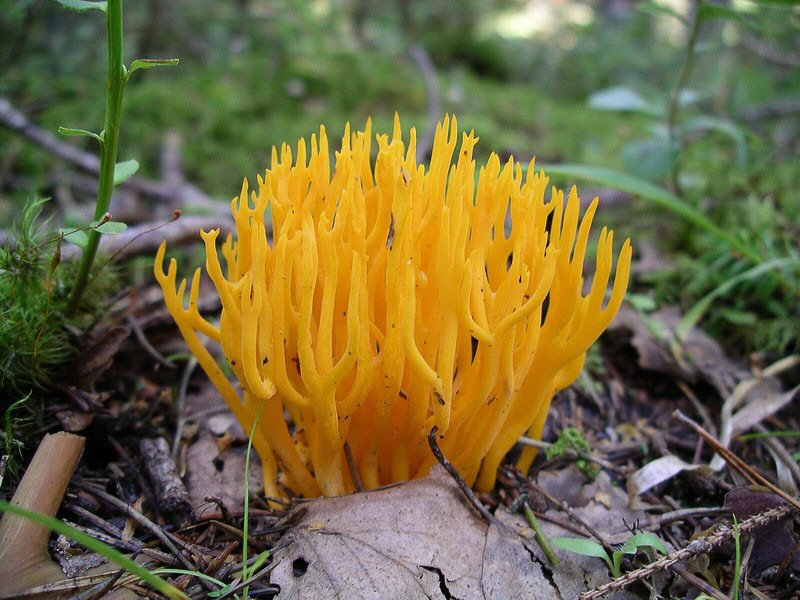 These are sometimes confused with coral fungi, but coral fungi are not slimy and are fragile, while yellow staghorn fungus is quite tough. Sometimes these fungi are more orange than yellow. They appear on areas of dead oak and other hardwoods that lack bark. Fungus tips branch into a distinctive Y shape. Plant Occurs in dense clusters with a common base, reaching a height of 1¾-6" (5-15 cm). Thin yellow (or pale yellow or cream) fruiting bodies become tipped with brown with age. Tastes bitter. Found under hardwoods or conifers. Fruiting bodies are usually separate (no common base), cylindrical but sometimes thicker near the top, sometimes partially flattened or twisted, with tips that are usually rounded. They are yellow-orange to orange. They taste mild. They are relatively short, ¾-1¾" (2-5 cm) tall × ¹/₃₂-⅛" (1.5-3 mm) in diameter. Found under hardwoods or conifers. Fruiting bodies up to 5" (12 cm) tall. Yellow, sometimes orange. They appear on areas of dead oak and other hardwoods that lack bark. 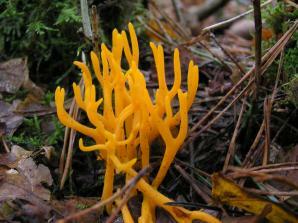 Fungus tips branch into a distinctive Y shape. 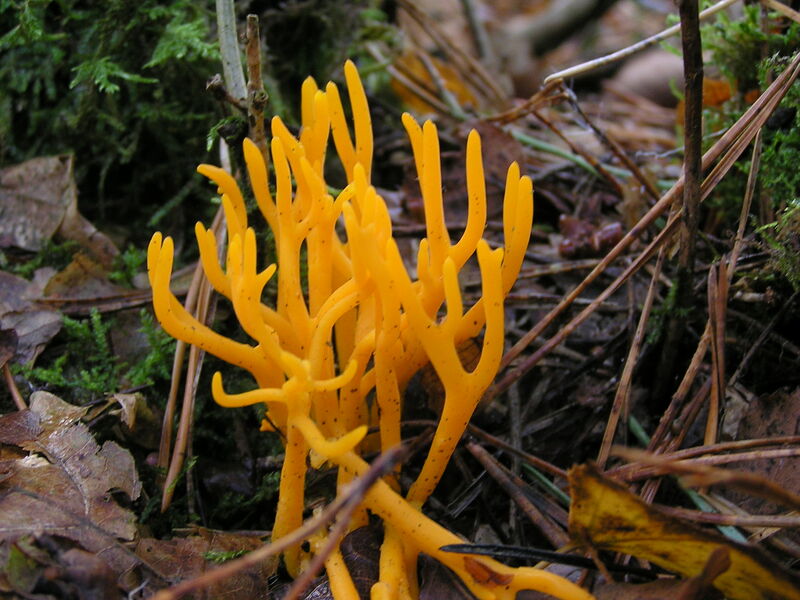 Calocera viscosa description by Thomas H. Kent, last updated 12 Oct 2018.